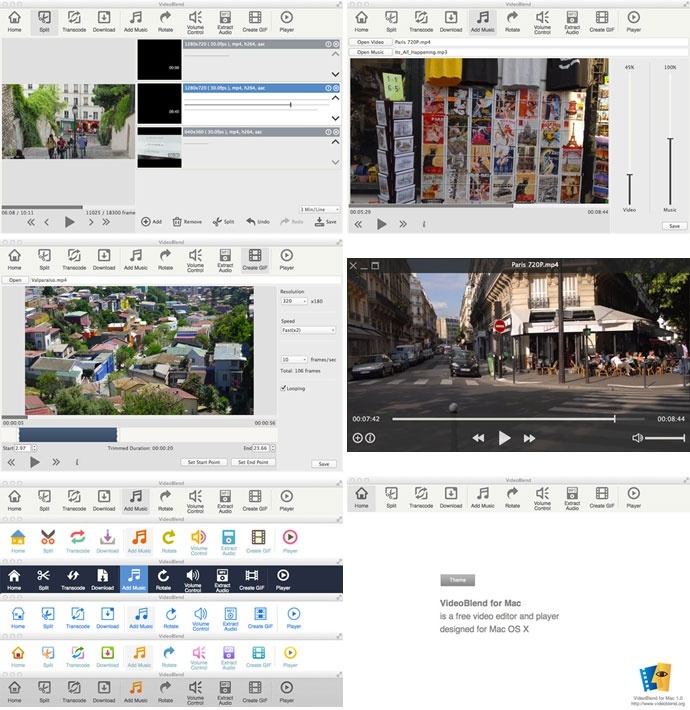 - Split: Trim, split and combine video clips. - Transcode: Change video formats, resolution, and quality. - Download: Save video clips from Youtube and Vimeo to your computer. - Effects: Add various effects to your video. - Add Music: Add and edit background music. - Rotate: Rotate video clips 90 degrees to any orientation. - Watermark: Add various text or image watermarks on video. - Volume Control: Adjust audio levels. - Extract Audio: Extract audio from video clips and save to MP3, OGG, WMA and WAV files. - Create GIF: Trim video clips to create animated GIF files. - Themes: Support various themes. For editing photos on Mac, check out PhotoScape X for Mac - a free photo viewer and editor.